A sellout 60 pegs took place at Carr Mill today with sub zero tempratures making fishing hard for all competitors. The overall winner was Andy Burrows (Champion Feeds & St Helens AC) who drew peg 79. Andy caught at 20m on cage feeder & worm to weigh a level 20lbs of bream & roach. 2nd on the day was Mike Flanagan who drew peg 106 weighing 12-04-00 of carp & bream to worm & maggot on the cage feeder. 3rd placed Les Heyes (St Helens Tackle) drew peg 116 weighing 10-08-00 to cage feeder with worm. 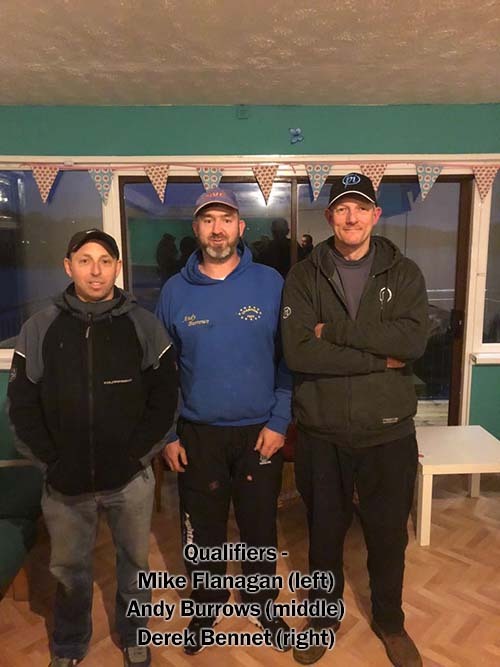 4th on the day was Mark Howarth (St Helens Tackle) drew peg 76 and fished the method at distance to weigh 09-08-00. A well run competition and our thanks to the organiser, Andy Burrows who was rewarded with a place in the March final.